How does a Battery Ignition System Work? Despite spending a lot of time in cars, buses and motorcycles, most people do not have a complete understanding of how their vehicle runs. While one may understand the basics of electricity, it is not uncommon to find a sense of intimidation among people when confronted with electrical issues in their vehicle. One of most common problems in vehicles is the loss of spark in the engine. In such cases, a spark plug is replaced and the vehicle is restored to full functionality. Yet, one’s knowledge of how all of it works doesn’t increase even after confronted with the issue. What happens when one is stranded without any help or replacement parts? How does one satiate the curiosity of young ones who are keen to know the answers to such questions? As intimidating as it may sound, Battery Ignition System is not rocket science. 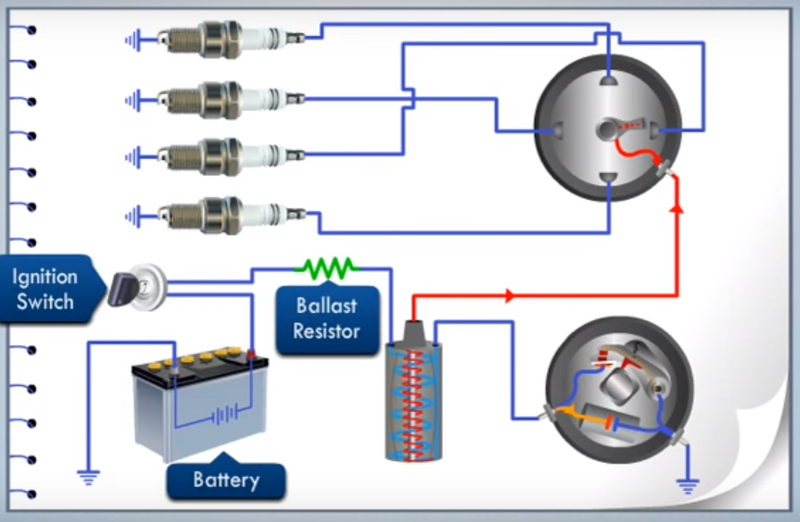 After reading through this article, you shall be able to understand and even explain to others how a battery ignition system works. Battery: Charged by a dynamo (hovertext: an electrical generator that produces direct current through a commutator) driven by the engine, a battery provides electrical energy for ignition. Ignition Switch: Connected to the battery on one end and with the primary winding through a ballast resistor on the other, this is a switch to turn the ignition system on or off. Ballast Resistor: The ballast resistor is made of iron wire connected with the primary winding between the ignition switch and ignition coil. An iron wire increases electrical resistance with rise in temperature. So when current flows for a long time from primary winding, the ballast resistor heats up and reduces the electric flow to prevent overheating of the primary winding and consequential damage. Ignition Coil: An ignition coil is made up of an iron core surrounded by two insulated coils, namely primary winding and secondary winding. Acting as a step transformer, it converts a minimal 6-12V of a battery into a high voltage of 15000 to 30000 volts. This high voltage enables it to generate spark across the electrodes of a spark plug. Contact breaker: The contact breaker is a type of an electrical switch. It interrupts the current flowing through the primary circuit to induce a high voltage in the secondary coil which generates the spark across the electrodes of a spark plug. Capacitor: A capacitor is made up of two metal plates separated by air. It is connected in parallel to the contact breaker to prevent damage to it caused by the rapid drop in current and magnetic field. In this way, it facilitates the generation of high voltage through ignition coil required for the spark. Distributor: A distributor is an electrical device used in the Battery Ignition System to distribute ignition pulses in exact sequence and at precise instants of time to the spark plug. 1. When the ignition switch is turned on, the current flows from the battery through primary winding, ballast register and contact breaker. 2. The flowing current induces a magnetic field directly proportional to it. 3. As the contact breaker opens, the current collapses resulting in high voltage induction in the secondary winding. 4. The high voltage current generated in the secondary winding is transferred to the distributor via a cable with high tension. 5. The distributor consists of a rotor that rotates inside the distributor cap, and opens the contact breaker point. This causes the high tension current to flow to the spark plug. 6. A spark is generated in the engine cylinder by the current upon reaching the spark plug which facilitates the combustion of fuel and air. Magic Marks is India’s leading elearning portal for engineers. It features video tutorials that make it easy for students to understand and grasp concepts quickly. It provides students with similar thorough explanations as given above through 2D imagery and high quality video. Register today and study engineering online, at your own pace.